South Indian Weddings are undeniably very different from North Indian ones. And amongst South Indian cultures, the Tamil population is the major group. Tamil weddings form an important part of the cultural potboiler of Indian weddings. That’s why, Tamil weddings are a must-attend event for everyone! Tamilians are famous for simple living and high thinking. So, one may wonder what’s the big hullabaloo about their wedding rituals. But precisely because this group of people adheres to the simplicity of age-old traditions and customs, paradoxically, Tamil weddings turn out to be one of the most beautiful and lavish occasions. Here’s why you must experience this cultural extravaganza at least once in your life! Tamil weddings are filled with traditional and spiritual symbolism that form the colorful canvas of ethnic India. The lavish colors in a Tamil wedding are a delight to the eyes. In a typical Tamil marriage scene, you’ll find a constant flow of bright red and sunshine yellow, bold vermilion and cool saffron strewn all around and send your senses into blissful dizziness. Traditionally, these colors also represent purity, spirituality, and passion. The bride’s sari, usually a traditional Kanjeevaram and her gold jewelry will dazzle you with more colors and shine. Similarly, the guests will be draped in lavish, colorful, rich silks. The rituals, the décor, the people, the food, all tend to be a feast of extravagant colors that mirror the rich spirit of this ancient land. Typically, in a Tamil wedding, a decent guest list spills over into a minimum of two to three hundred guests, comprising of the extended family, distant relatives, acquaintances, and friends. 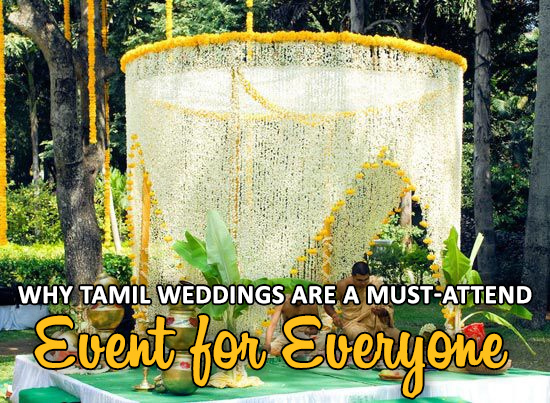 You can experience one of the ridiculously largest wedding gatherings in all of the Indian marriage functions in Tamil weddings. The guests are equally colorful, lavishly dressed, ornamented and pleasantly noisy. It is a unique experience to watch such a huge gathering coming together, simply to attend a ceremony and bless the newlyweds. Only in a deeply traditional Indian wedding, a cacophony cannot sound harsh, but melodious. Tamil weddings make use of a variety of ingenious sounds such as the South Indian flute (shehnai), the Vedic incantations, the traditional songs, and the guests chatting away in fluent native Tamil tongue. It’s indeed a stunning experience of sight and sound that a typical Tamil marriage scene offers. One has only to allow oneself to be drowned in this busy, bustling and unique sound shower. As said already, Tamil weddings strictly adhere to ageless customs and traditions, and hence, they are a rich experience of ancient Indian nuances for anyone attending the ceremonies. From Kala Pathrika (matching the horoscopes and deciding a wedding date) to Kalyanam (the actual wedding ritual), there are seemingly endless sets of lavish rituals that show us the deeply symbolic faces of the culture. One may say that Tamil weddings are not as extravagant as some of the Northern weddings such as the Punjabi weddings. However, the richness of Vedic rituals, spiritual rites, and folklore-based norms of a Tamil wedding remains incomparable. Their wedding rituals are based on some of the oldest sacred rites mentioned in the ancient text of Hinduism, the Veda. It can be easily said that as you walk into the various settings of a Tamil wedding ceremony, you start feeling as if you are walking into a royal affair filled with magical moments. Tamil weddings, for starters, take place early in the morning. If not for any other reason, but to experience this absolutely unique dawn-kissed setting of a traditional wedding, you need to attend an authentic Tamil Kalyanam. The venue is usually some original temple courtyard. This courtyard is lavishly decorated with flowers, torans, and auspicious festoons. Here, the bride’s family hosting the wedding, decorate the ‘manavarai’ that is the ceremonial wedding canopy, with bright colors, flowy décor, flowers, festoons, Kalash (earthen pots) and Rangoli (colorful designs). As you walk into such a setting in the golden light of the rising sun, the entire ambiance feels like a magical and mystical hour hailing love and union of two hearts. The extensive wedding ceremonies start days prior to the main event with Kala Pathrika rite (setting the wedding date) and Sumangali (worship of the married women) where each ritual is an unparalleled experience to be a part of. Just the ceremony of Pallikai Thellichal is extremely lavish and colorful, where many kinds of grains mixed with curd are poured into seven earthen pots and smeared with sandalwood. The pots are later immersed in the water as an offering to the fishes, a symbol of auspiciousness. Sumangali Prarthanai is yet another unique ceremony to be found in Tamil weddings. Women who are married and living a prosperous and harmonious married life are referred to as Sumangalis, and such women in odd numbers are worshipped and prayed to by the bride-to-be who then seeks their blessings for a successful and harmonious conjugal life. This ceremony is again dazzling and colorful as each of the Sumangalis are made to wear the traditional nine-yards Madisar sari of vibrant colors. Thereafter, the sumptuous feast of authentic South Indian food is offered to them on a traditional banana leaf. This rite is altogether a feast to our senses. On the actual day of the marriage, first, an Aarti (fire oblation) is performed, and the auspicious fruit, a coconut, is broken to usher in divine blessings and protection. In the middle of the richly decorated, colorful Mandapam burns the holy wedding fire, ignited and invoked as to the holy witness to the couple’s vows. The long and detailed rituals such as the Kanyadaan, the smearing of Sindoor and the thali Kutta (tying of the thali, the Tamil equivalent of a mangalsutra) is performed with great pomp, pride, and precision. Each ritual is a sight to behold as a cultural symbolism to explore. The rite of Saptapadi, where the bride walks seven steps rolling a rock forward with her toes, symbolizes the determination with which she presses on in her marital vows to make the union successful. The groom holds her toe, signifying his equal contribution to the marital bliss and success. Thus, altogether, the Tamil Matrimony is an unparalleled experience filled with culture, customs, colors, pomp, emotions, and fun. It is such a unique canvas of ethnic and ancient Indian nuances that one must attend a Tamil wedding at least once in their life. This entry was posted in Wedding Trivia and tagged Indian bride, matrimonial site, tamil bride, tamil groom, Tamil marriage, tamil matrimonial service, tamil matrimonial site, tamil matrimony on November 20, 2018 by TSILV.